Thanks to The Three Muses for this wonderful challenge - "Birds of a Feather." One of my favorite topics! This little Junco told me he would like to join in the fun! What beautiful colors, and what an impropos name ... junco. Seems he should have a more regal name, doesn't it? Thanks for sharing your talent, and joining our challenge this week! Gorgeous! Love the colours you have used. Wow! Your picture is exquisite. I love everything about it - the background and the painting of the "junco". Simply beautiful. Thanks so much for joining in the challenge this week. your bird just glows!! really wonderful! Your Junco is beautiful! I love your blog. Birds are one of my favorite subjects too. 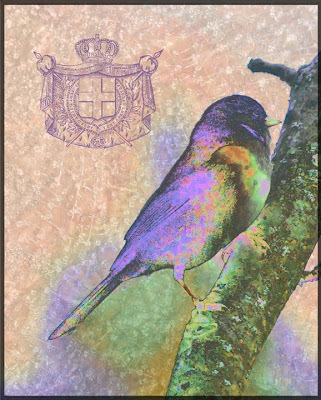 There are alot of bird images (including photos and pastel paintings) on my blog. Please visit and let me know what you think. I finally watched How to Steal a Million and LOVED it! I loved Audrey's wardrobe, and she and Peter O'Toole worked so well together! Aaaaah, exquisite. This fills my eyes--which is the greatest compliment I can give.